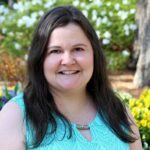 Heidi has served as HOPE3 Ministries’ webmaster and social media manager since the early years of the organization. She is currently the secretary of HOPE3‘s Board of Directors, and leads the Communication, Fundraising and Marketing team. She also creates and edits the Ministry’s newsletters. Heidi grew up in Germany and has been a joyful member of church choirs since she was eight years old. She currently lives in Hampton Roads with a couple of cats, and she recently began her doctoral studies in higher education.